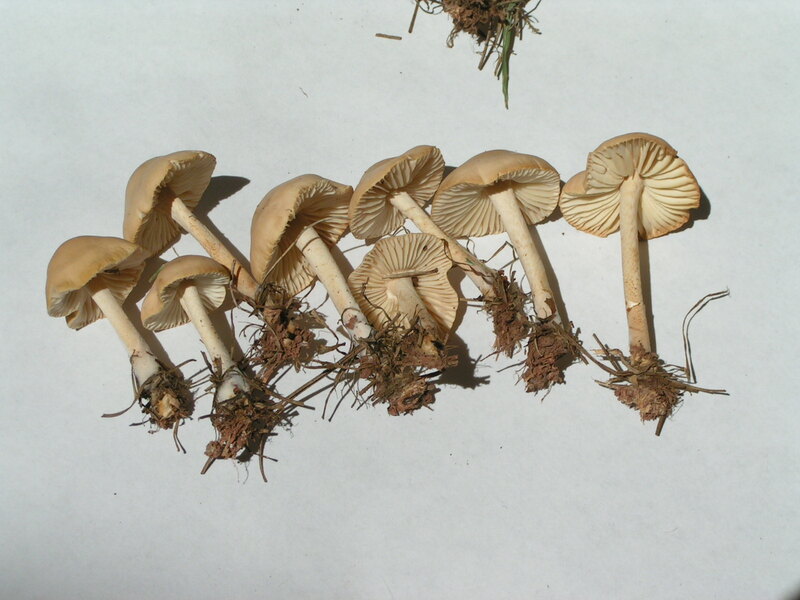 Marasmius oreades is also known as the scotch bonnet or fairy ring mushroom. 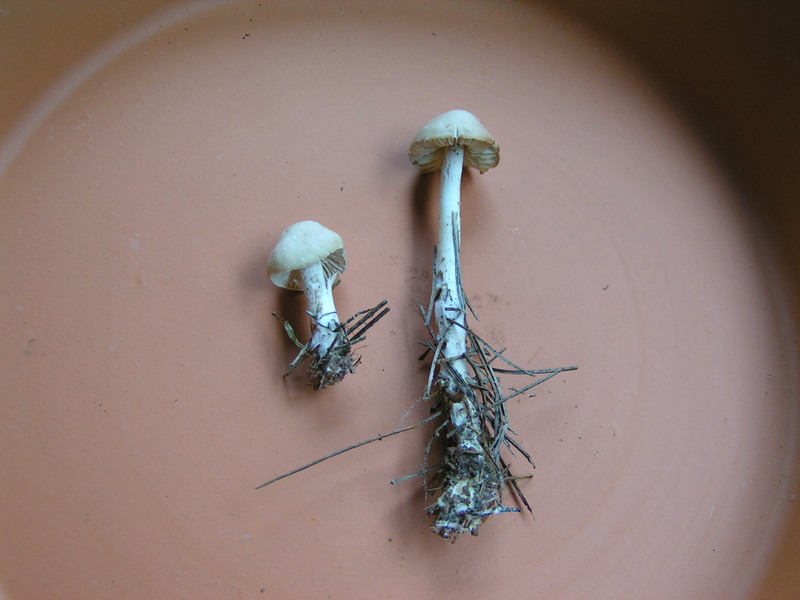 The latter name tends to cause some confusion, as many other mushrooms grown in fairy rings (such as the edible Agaricus campestris, the poisonous Chlorophyllum molybdites, and many others). 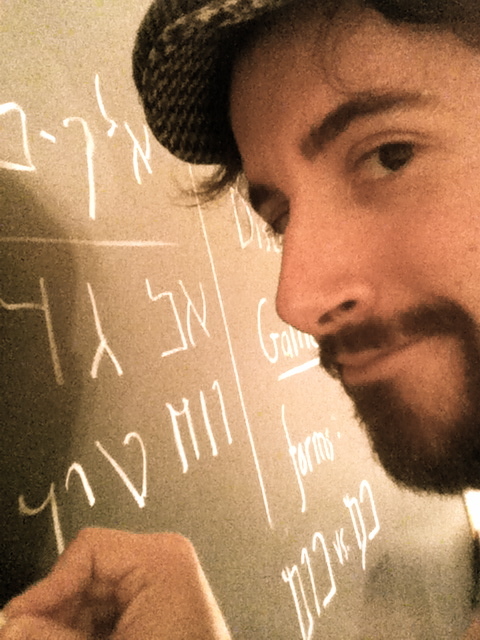 It happens to be one of my favorites as it has the special ability to cheat death. If you ever eaten M. oreades, you’ll notice that it has a distinctive sweet flavor. This is because it harbors a high concentration of a special sugar known as “trehalose” which acts as a xeroprotectant (a big, fancy word for “something that protects against drying out”). 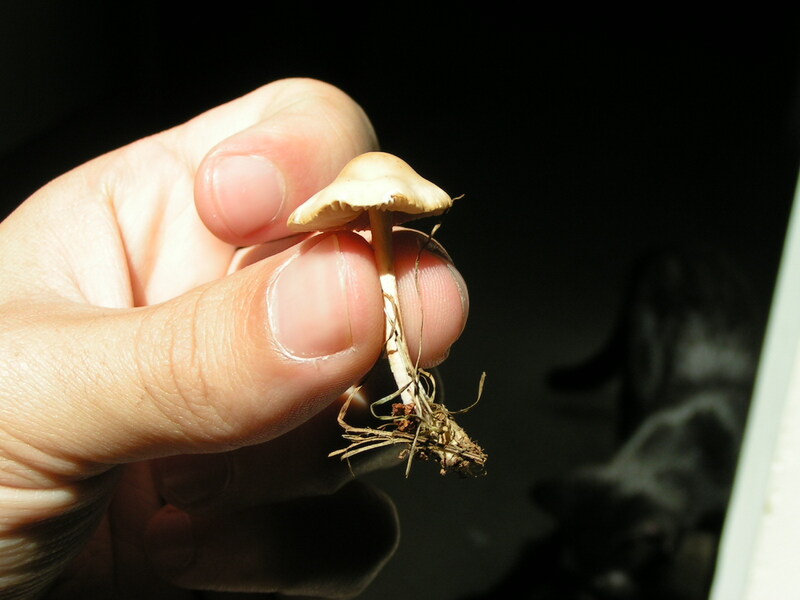 Once water is re-introduced to a completely dried out mushroom cap, the trehalose revives cellular function, starting spore production and cellular growth. In other words, M. oreades is a zombie mushroom! This proves that you’re only really “dead” once you’re really digested. About 1 cm up to 5-6 cm across. Starts out very convex, but then expands to umbonate with a very distinctive bump in the center. Usually tan or buff, to really pale buff. It’s hygrophanous (which means it changes color as it dries, see the pictures above) and has flesh the same color of the skin. Distant, pale-buff to almost white. Sometimes free from the stem, sometimes attached but never running down it. 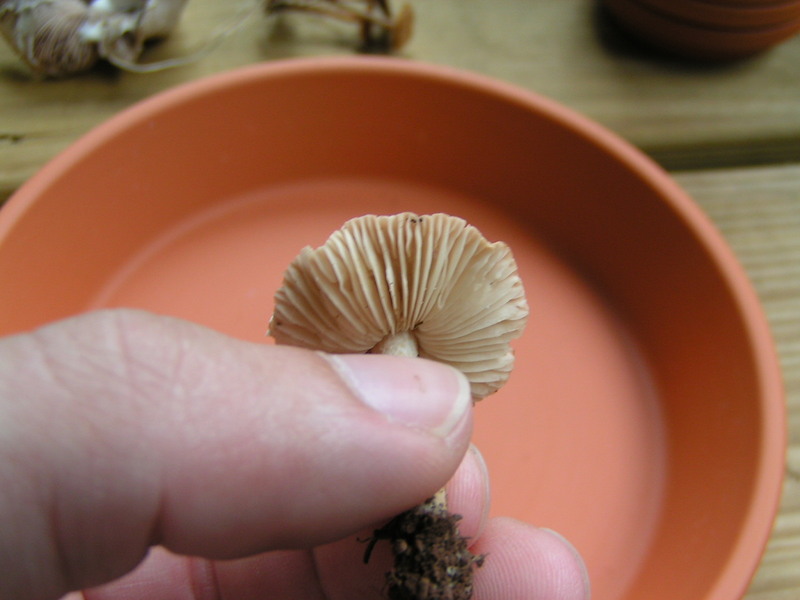 In mature specimens they tend to stick out of the bottom of the cap distinctly, which you’ll see in the pictures above. The most distinguishing feature of the stem is how tough it is, and how nearly impossible it is to pull off without damaging the cap (you can shake an M. oreades by the stem very hard and cap stays on tight). Other than that it’s the same color as the rest of the mushroom with no ring. Usually (but not always) if uprooted, it clings on to bits of organic matter with a small fuzzy clump of basal mycelium. The print is either chalk-white or very pale buff (never brown). Where most spores from samples that I’ve collected look more subglobose (i.e. round) near 7-8µm c 5-6µm, most field guides identify them as elliptical at around 7-10µm x 4-6µm in size. As mentioned above, they’re a bit sweet. 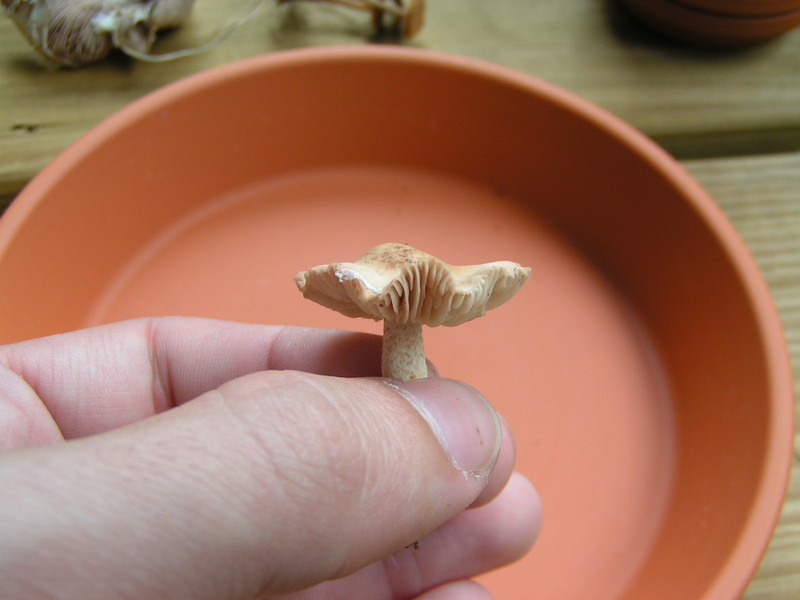 Very different from other mushrooms, but they go great in things like omelettes and even cookies. However, discard the stems as they have the texture of air-dried ginger (very tough, fibrous and not pleasant to chew on). Because of their undead revival trick, the best way to preserve M. oreades is by drying. Traditionally the stems are clipped off, and the caps are threaded like buttons on a string and left in a cool, breezy place. After they’re done drying you can stick the strings into mason jars for practically indefinite storage. No need to soak in water beforehand when you wish to cook with them either, so long as there is sufficient moisture in the dish you are preparing. 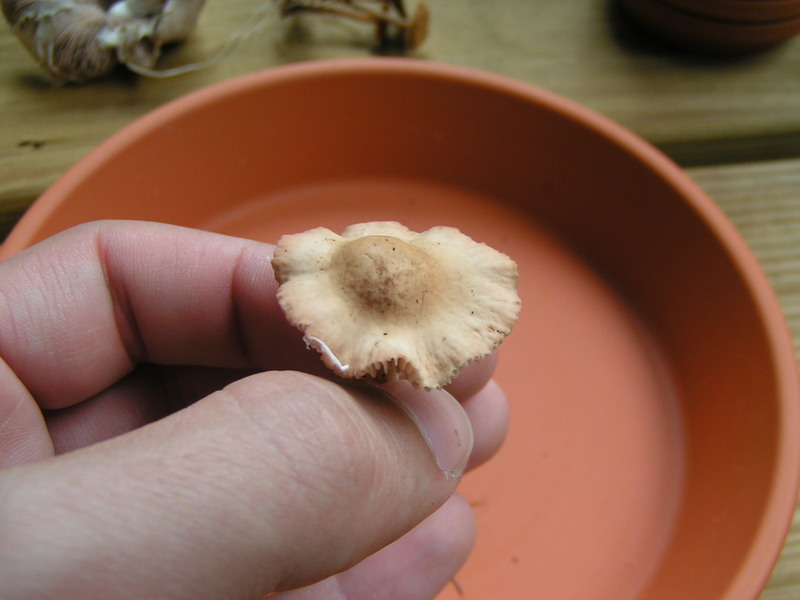 View Marasmius oreades specimens from my mushroom journal.